On a family holiday to Donegal, we visited the Five Fingers Strand. Struck by how amazing this beach was, I immediately thought up an Earthcache to bring people to this stunning spot. Given the beauty of the area, I think it is well worth the diversion on the way towards Malin Head to tick this Earthcache off. This is a two stage Earthcache designed to bring you to the best beach I've ever seen and have a look at the nearby sand dunes, followed by a short drive to a viewpoint over the beach where you get a quite simply amazing view of the area and the whole dune field. Parking at Stage 1. I strongly recommend parking at the church (co-ordinates given) and walking the 300-400m to the beach. I would not advise driving further down the track as THERE IS NOWHERE TO TURN THE CAR AROUND AFTER THE CHURCH. Parking at Stage 2. There is ample parking at Stage 2 (co-ordinates given), with plenty of room to turn. I would recommend visiting this Earthcache at low tide. The tidal range over the beach is about 600m, and to walk that far out to sea along the sand is fascinating. A nice day is also recommended! There are a few images on the cache page but if you don't have these in the field you should still be able to use the information on the cache page to answer the questions. In physical geography, a dune is a hill of sand formed by interaction with the flow of air or water. Some coastal areas have one or more sets of dunes running parallel to the shoreline directly inland from the beach. These dunes are important in protecting the land against potential ravages by storm waves from the sea. Many different types of dunes exist... Barchan (crescent shaped, hard ground), Linear (long & straight, limited sand supply), Transverse (large fields of dunes that look like big sand ripples, wind from one direction), Parabolic (U-Shaped, open at one end) and Star (More random with several arms, multiple wind directions). 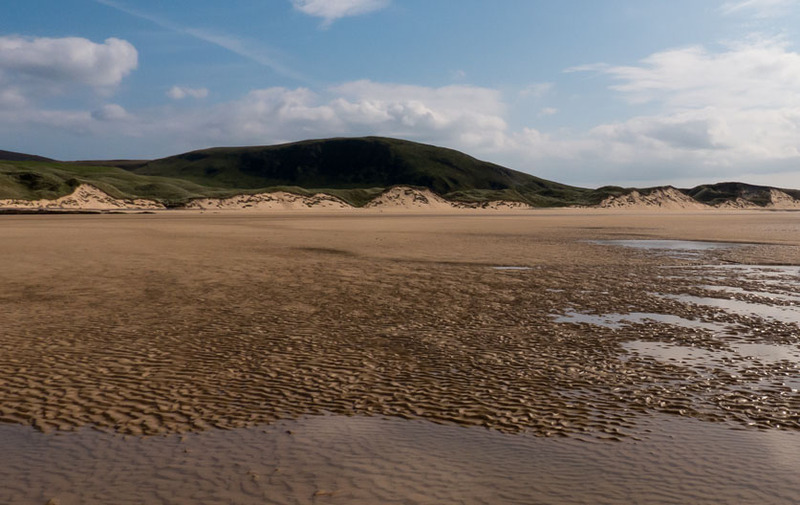 Sometimes, Barchan Dunes 'mutate' to form Transverse Dunes. All of these dune types are illustrated in Figure 1. 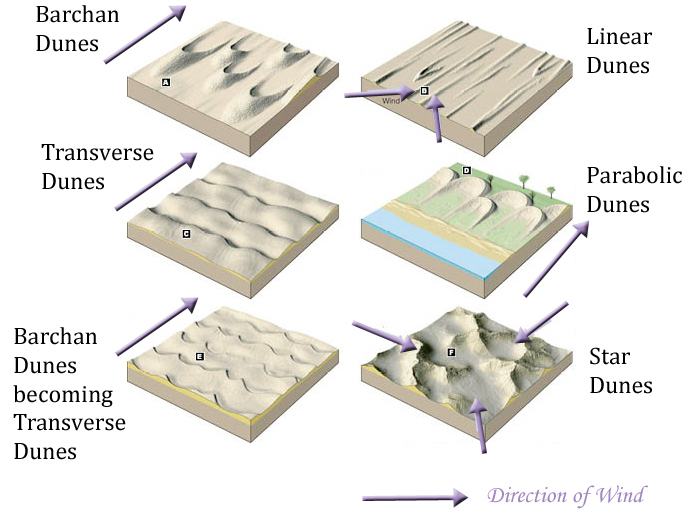 Figure 1: Types of sand dunes, showing wind direction crucial for formation. The beach is the sole source of sand for coastal dunes, and every single sand grain in a dune has come across the beach at some time in its history... probably many times. Regardless of the general wind circulation patterns of the region, winds will blow onshore at least some of the time, and if there is vegetation present, some of the sand will be trapped and over time this may grow a dune. Alternatively, piles of sand accumulated in the lee of beach debris (e.g. seaweed) slows down the wind or blocks it, causing sand to accumulate in the wind “shadow” of the object. Eventually, dune grass seeds find their way to the new piles of sand, germinate, sprout and trap more sand. The vegetation that caused the sand accumulation to begin with now furnishes nutrients to help the new seedlings survive. As the plant grows it continues to cause more and more sand to accumulate. If all goes well and the surf zone stays far enough away, a new dune is born! As these embryonic dunes grow, the vegetation keeps moving up and out, holding much of the sand in place. Over time, it gets bigger and bigger... limited of course by local effects and storms. Figure 2 illustrates this in action. At The Lagg Sand Dunes, you can see some fantastic examples of this process in action. In this part of Donegal, storms and vegetation have created a set of dunes said to be one of the largest in Europe. Certainly, they are tall, and the field extensive. Your task in this Earthcache is to measure some aspects of the dunes, look at how they were formed, and appreciate the earth science behind these magnificent, yet delicate structures. Cache co-ordinates, on the beach. You will find yourself standing underneath a tall dune. (Q1) Estimate the height of this dune. (Q2) Is there vegetation present on the dune? Using this information and that on the cache page, speculate on how this dune may have formed. (Q3) Look at and feel the packing of the sand in the dune. Look at and feel the packing of the sand at ground level a few tens of meters away, below the high-tide mark. Do you see/feel any difference in how these two are packed together? Are they loosely packed or well packed? Using this information, tell me if you think the dunes erode faster or slower than the beach below them. Drive to the viewpoint of Stage 2, known as the Knockamany Bens. Look at the dune field, the beach below you and the awe-inspiring view. If the weather is poor, visibility may be limited. Do your best with the questions here, I'll be fair! (Q4) From up here, you can see the entire dune field. Using the information on the cache page, tell me what type of dunes these are. (Q5) Estimate the area enclosed by the sand dunes in the area along the beach and back to the road. Use the height of the sand dune measured above as an approximate reference to get you started. (Q6) Looking at how the tides flow into the area, do you think the sand dunes are mostly eroded by general tidal action, or by storms. Why? Logs without answers emailed within a reasonable time may be deleted. If you honestly believe you have answered the questions correctly, go ahead and log but please send me the email when you get back from holiday, etc. I'll be in touch if there is something major wrong, but in any case I'll be fair. Hope you enjoy this Earthcache!